It was not unusual for the Romans to place the heads of the deceased by their feet. In November 2011, when Chris Birks Archaeology excavated a trial trench in Great Ellingham, Norfolk, on the site of a future housing development, little did they know that they were about to uncover one of the biggest Romano-British burial sites in the region. The eponymous archaeologist and his team stumbled upon several in situ burials and isolated artefacts confirming that a cemetery extended in to the development site. When work concluded in early July, 85 graves had been discovered, making Great Ellingham the largest excavated Roman burial site in Norfolk. The cemetery has been dated to the 2nd and 3rd centuries thanks to the discovery of a small pottery assemblage. A view of the Christian cemetery. Despite over 300 known Roman burials in Norfolk, Great Ellingham is the only site where un-worked flint nodules have been found placed in graves. Although flint is naturally-occurring in the region, the way in which it has been placed around the skull, pelvis or feet of several bodies has raised questions about the nature of the burial rites. Another notable discovery was a skeleton with an iron finger ring — the only grave good found in the cemetery — lying by their ribcage. 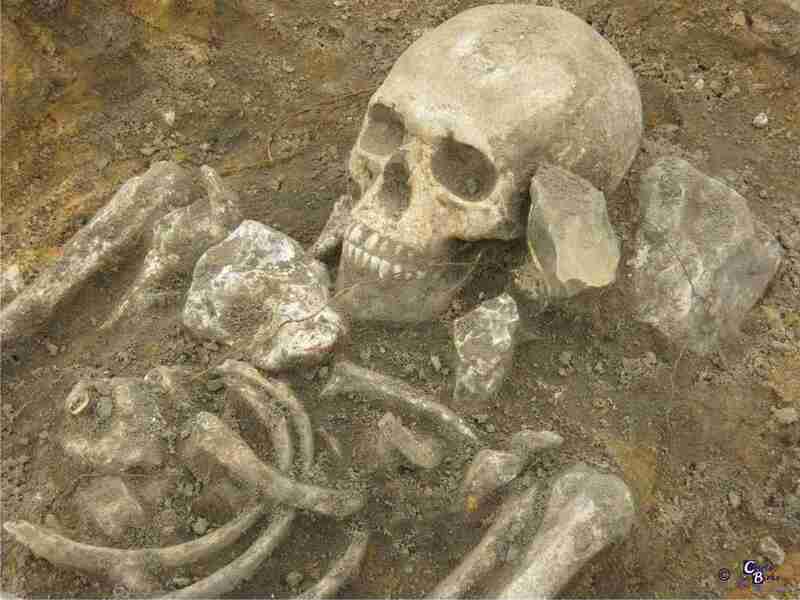 Some burials had flint nodules placed around the skull. Flint deposits were found by the pelvis and feet of some of the skeletons. 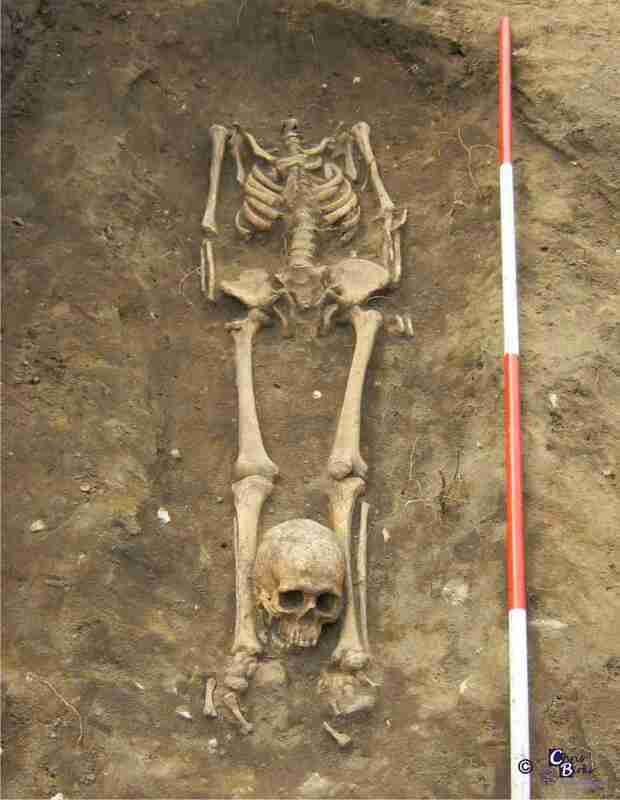 Archaeologists found one decapitation in the cemetery. Chris Birks, who carried out the excavations, suggests that this individual would have been a social outcast, criminal or perhaps a murder victim. This particular find will no doubt fuel the ongoing debate about whether such treatment of the dead was a punishment, or in fact an attempt to speed the deceased’s passage to the afterlife. (For more on this, see CA 244 ‘Deviant Burials’). The full extent of the cemetery is still unknown but Chris, who has worked extensively in Western Europe, says that the size of the site must be indicative of “a large, or at least long-lived, settlement given the number of burials we have found”. Chris hopes to answer some of the questions posed by the site and its bodies early next year after carrying out radiocarbon dating of the human bones, and analysis on the pottery, soil samples and iron ring. Who knows what they might discover?